51400-RB is rated 1.0 out of 5 by 1. Delta® Decorative Grab/Slide Bars are ADA Compliant. They can be positioned 33 to 36 inches above the finished floor. The bars do not rotate within the fittings and will support up to 500 pounds of force, twice the ADA requirement of 250 pounds of force, when properly installed. A retrievable grab/slide bar wall anchor is also included for ease of removal. Delta is committed to supporting water conservation around the globe and has been recognized as WaterSense® Manufacturer Partner of the Year in 2011, 2013, and 2014. Innovative Pause feature allows you to conserve water while lathering up. Grab/slide bar diameter is 1-1/4 in. Do you sell ADA approved Slide Bars for hand held showerheads? 51400-Does the bar come greater than 24 inches? if so, what is the sku number? Can the hose length be shortened, or is a shorter length hose available? 89&quot; of hose sounds like way too much. The length of our shower is 60&quot; with a bench on the back wall. when will this product be availlable? How much does the Palm hand shower weigh? 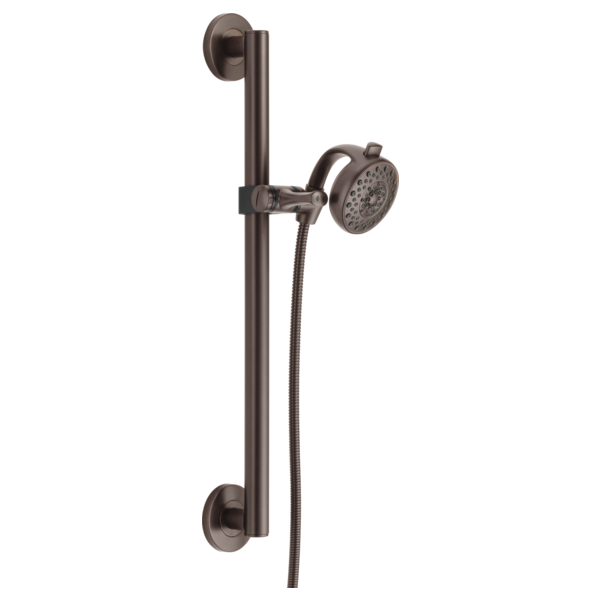 How much does the palm hand shower weigh and what material is it made of (all chrome or plastic)? 51400 - how do we adjust the spray? These were installed in our newly built home. We've only been able to get &quot;rain&quot; spray and a narrow stream. Contemporary bar with different hand shower? Slide bar mount to hold handheld has broken, what is the part number to order more?